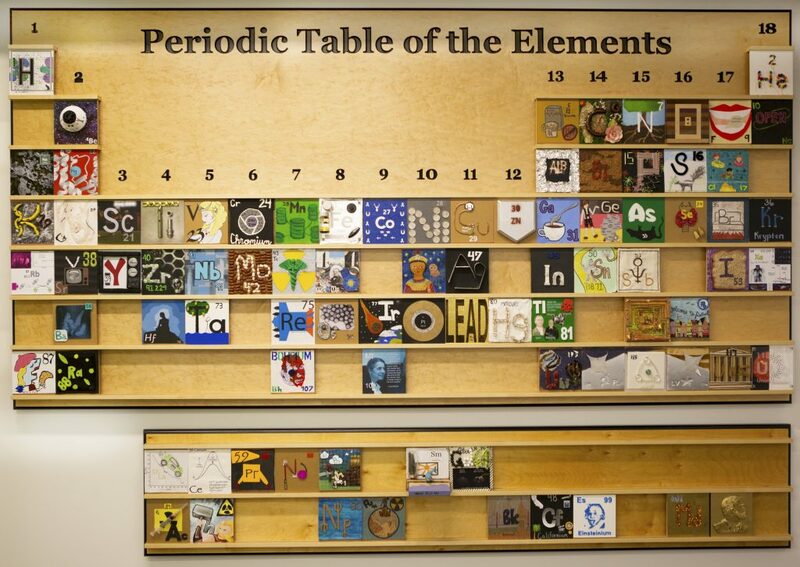 The Periodic Table: Cooler than you think! If you’re studying science at all, you need Dr Claire Murray in your life. (Note: you can’t actually have her as we own her and keep her in our filing cabinet.) Claire is OBSESSED with science and she has a knack of making every bit of it sound as amazing and interesting as it actually is really. 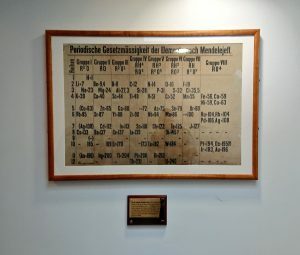 2019 is the 150th birthday of the Perdiodic table, (what do you buy the periodic table that has everything, ammirite?) and Claire wants to remind us all how important it is to us all. Take it away Dr. Claire…. Have you heard about the periodic table? It is one of the most recognisable shapes in the world and it is incredibly useful. All of the different letters are different elements which are the tiny building blocks for the world around us. We breathe in oxygen gas (O2) and then breathe out carbon dioxide gas, which is two oxygens (O) connected to one carbon (C) – CO2. Our body contains at least 60 of these elements, which makes our body chemistry pretty complex! We are 99.5% oxygen, carbon, hydrogen (H), nitrogen (N), calcium (Ca) and phosphorus (P). Mobile phones contain lots of different elements like lithium (Li) and cobalt (Co) in the battery, copper (Cu) and aluminium (Al) in the circuit board, yttrium (Y) and gadolinium (Gd) in the screen, lanthanum (La) in the camera lens and neodymium (Nd) in the microphone and speakers. Elements are, quite literally, everywhere around us and so a way of organising them and understanding their properties is very helpful. Chemists have spent hundreds of years finding a way to do exactly this, and in 1869 the modern version of the Periodic Table was suggested. 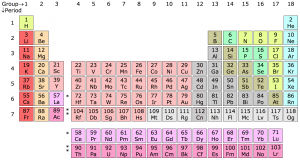 Since then it has changed a lot as we learned more about the elements and discovered new ones or made them in labs. As an example, compare the version above, which is one of the oldest versions in the world (dating from around 1879), to the version below. There are obvious differences like colour, but the shape and number of elements are the important parts here and they have clearly changed quite a lot. Scientists have also had lots of heated discussions about spelling the elements. One of the longest running debates was around element # 16 S and # 13 Al. American chemists used sulfur (S) and aluminum (Al) whereas British chemists used sulphur and aluminium. We sorted this out in 1990 after many years of arguing and we now all use sulfur and aluminium as a compromise. Elements change name in different languages too – we call element # 74 tungsten (W), whereas the Spanish and Germans call it Wolfram/Wolframio. The issue of naming elements has now gotten so complicated that we have set up a committee just to deal with naming new elements! A fun fact is that the most requested name for an element is ‘Lemmium’. 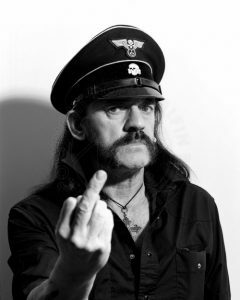 This is in honour of the deceased rocker Lemmy Kilmister from Motörhead – Chemists clearly like their rock music! If you are intrigued by the periodic table then I suggest you check out our project. We are having a year long party to celebrate 150 years of the Periodic Table and you are most definitely invited! You can find us on Instagram and Twitter and we’ll be sharing cool facts about the elements and showing what they look like when they are inside crystals! Our first element is Neon (Ne).